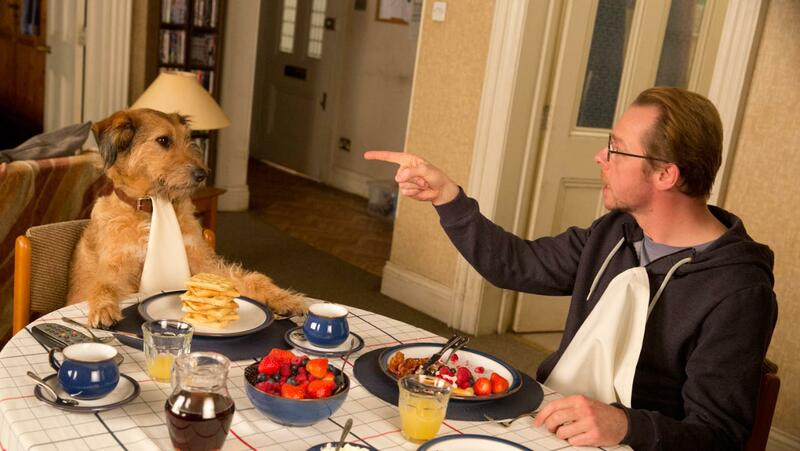 So, Simon Pegg's Neil is unwittingly given the power to wish absolutely anything into being. From penile dimensions to climate control he tries this very thing, fulfilling the film's sole joke about the need for care when being absolute. There's more at stake, though. If his wishes are for good rather than evil he might also save the earth from extra terrestrial destruction. The aliens who have staged this test are animations voiced by the surviving members of the Monty Python team. 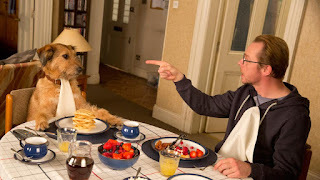 And the dog is voiced by Robin Williams in his final screen role. So, good times? Here and there. Incidentally. Actually, any watery qualifier you can think of that fuelled many a strong Python sketch in the heyday would apply here. This is not a Python film, even though they are in it and it was directed and co-scripted by Terry Jones. It is not a Python film because apart from some absurdist situations that pop up it is far more like a grimier Richard Curtis film. Acutally, if this were a Richard Curtis film it would be a breakthrough and feel funnier than it is through the sheer relief that it isn't yet another rollout of his big canvas romcoms. When the darkly reptilian aliens switch to English they call each other names like Sharon and Maureen. This is old rather than classic Python and to hear it here offers more of a wince than a laugh. And, while much of the action and the hijinks with the various wishes and their consequences can delight, it plays so far short of the standard that might bypass delight and speed on to screaming edgy laughter. Jones co-wrote and directed Meaning of Life, after all which is one of the least loved Python outings until individual scenes are recalled and the reconstituted memory elevates it to the highest of their work. Its darkness and violence took the brand much further than the various projects of the individuals and pairings from the team at the time (anyone remember Yellowbeard or Erik the Viking?) So, if I admit that it's not a Python film what am I going on about? And this review is disintegrating in my hands. It's not just my hangover, I just can't find much of any value to say of it beyond its flagrant waste of pedigree. How such a crew of good, highly watchable performers could be left wandering the screen, their responses to situations too lingering rather than overplayed is frustrating. As a child I saw a British film from the same H.G. Wells short story, The Man Who Could Work Miracles, and remember it as a tightly constructed and enjoyable morality comedy with a typical but permissible Wellsian sermonising climax. This not only serves as a ready comparison with Absolutely Anything but a reminder of all those times I've heard someone herald a recent film, song, novel or tv show, or other cultural artefact as a whateveritis for the twenty-first century. Usually, all they are referring to is that the thing they are lauding so was made since 2001 and not to any cultural, textural or profound updating to bring an old story in through the filter of contemporary life. This film is not a Life of Brian for the twenty-first century, it's a lightly enjoyable shadow of Life of Brian from the twenty-first century. If that's your dig, run don't walk. I staggered ... away.